Most cruise lines offer the option of adding on a drinks package, either when you book, or when you board the ship. Purchasing this will turn your cruise from full-board to all-inclusive, which can be a great option for people who like to drink as much as they like, without worrying about the bar tab. When deciding whether a drinks package is right for you, it’s important to consider how many drinks you plan to drink to know whether it’s worth it or whether you should just add your individual drinks on to your cruise bill. These are the packages which include any drinks you like (beers, wines, cocktails, spirits, soft drinks, tea and coffee). Note that cheaper drinks packages may also be available for a reduced selection of drinks e.g. beer and wine only or soft drinks only. Bottle of beer = $5.50. You need to drink 12 beers per day! Glass of wine = $10.00. You need to drink 7 wines per day! Glass of wine = $5.50. You need to drink 12 wines per day! Bottle of beer = $5.50. You need to drink 15 beers per day! Glass of wine = $6.25. You need to drink 13 wines per day! Bottle of beer = €2.90. You need to drink 15 beers per day! Glass of wine = €4.50. You need to drink 10 wines per day! Can anyone drink that much??? And more to the point, is it medically advisable? You’d be right to think that drinking 15 beers or 13 glasses of wine every single day of your cruise is a terrible idea. Especially when you consider that most days you’ll be ashore all day so you’d have to fit that number of drinks just into the evening. Your drinks package also includes soft drinks, water, teas and coffees. Have one of each of these and you’re already on £10. If you like spirits and cocktails, these can be quite expensive. With Royal Caribbean’s cocktails costing $12 each, you’d only need to drink 6 of these to get your money’s worth. If you spent £10 on a cocktail and it was really small, all ice or you just didn’t like it, you’d be very disappointed. When they’re all included, you can just order a different one! Not having to think about the cost of drinks is very relaxing. 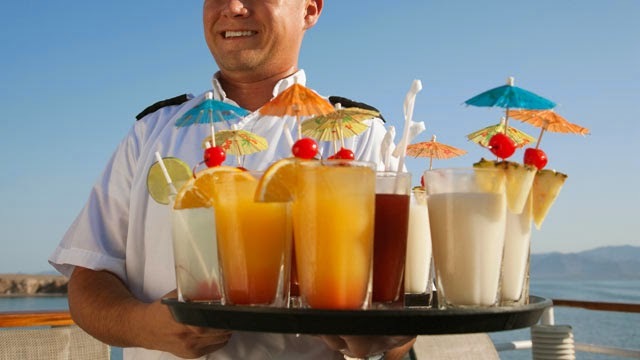 When the drinks man comes round the pool with his tray of cocktails shouting ‘medication for your vacation?’, you’ll be glad that your cruise is all-inclusive. Weight up the costs of the cheaper packages. If you mostly drink beers, wines or soft drinks, the top package which includes spirits and cocktails probably isn’t right for you. 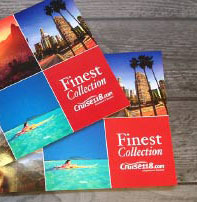 Ask your Cruise Concierge about the various options available when you book. Get a free drinks package! Cruise lines often offer incentives to get you to book with them, with free drinks packages available when you book during promotional periods. Looking out for these can save you hundreds. Your Cruise Concierge can advise you further. If you’d like help in finding a cruise with a free drinks package, or would like more information about all-inclusive cruises, our Cruise Concierge team will be happy to help. Just give us a call on 0207 980 2847. Hi Rumyana, Of course! A member of our Cruise Concierge team will be in touch with further details. Thanks, Emma. Hello does anybody know the drinks package on the royal Caribbean does it include champagne in the champagne bar. Hello Patricia, There are a few drinks packages available on-board Royal Caribbean. The Deluxe Beverage Package includes all alcoholic drinks up to £13 in value. Champagne is slightly more than $13 per glass, so you will be charged the difference in cost when you order. This Drinks Package is around $44 – $55 per guest, per night. Hope that helps! Thanks, Emma. Royal Caribbean drinks package is good value. I am not a big drinker but enjoy a Strawberry daiquiri (or two) by the pool everyday. When you add in a couple of coffees and a soft drink, it soon adds up. Hello, the drinks package is great value and well worth it for a hassle-free holiday. And who doesn’t love a poolside strawberry daiquiri! Best, Emma.